Ed at Lookout Point at South Mountain Park in Phoenix. 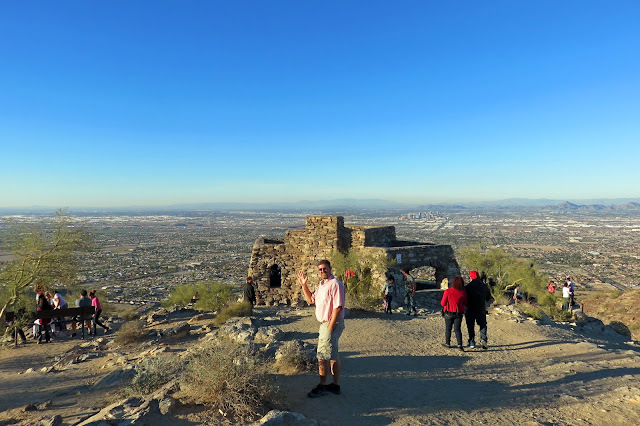 According to Wikipedia, South Mountain Park, at 16,283 acres, is the largest municipal park in the United States and one of the largest urban parks in North American and the world. It was created in 1924 when President Calvin Coolidge sold its initial 13,000 acres to the city of Phoenix for $17,000. The lookout rises 1,000 feet above the desert floor. You can see Phoenix sprawled out in the background, behind Ed. I can only imagine how amazing the view must be at night.